"Hypnotic," "thrilling," "astounding!" These are some of the words used to describe the first program of the Littleton Lyceum's 179th season which featured the Odaiko of New England Japanese drummers. The performing arts center at Littleton High School filled with almost 500 people on Friday, October 10, in anticipation of the evening's drumming. On stage were several large wooden drums, like tympanis, called "taikos," to one side was a small drum, like a snare, called a "shime," while in back of them all was a very large drum on a high stand. This was the "odaiko," the "huge drum." Yet when the performance began, it was none of these drums being played, rather a musician with a drum strapped to his shoulders entered dramatically from the back of the hall. Wearing a monkey mask and beating a tattoo, he would pause before delighted children and amazed adults as he made his way, clowning, to the stage. This "monkey man" was Mark Rooney, current director of the Odaiko New England Japanese drummers. Entering their 15th year of performing, the drummers have performed over much of New England as well in the Midwest and Florida. Some may know them from Fenway Park where several times they have accompanied trumpeter Tiger Okoshi in performing our national anthem. Drumming has for centuries been part of Japanese culture, being used to tell stories and celebrate festivals. Japanese Americans continued the tradition starting 40 years ago in San Francisco. According to Rooney, they didn't have the resources to import taikos and odaikos from Japan, which might cost as much as $10,000, so they improvised and refitted oaken wine casks and whiskey barrels as their drums. 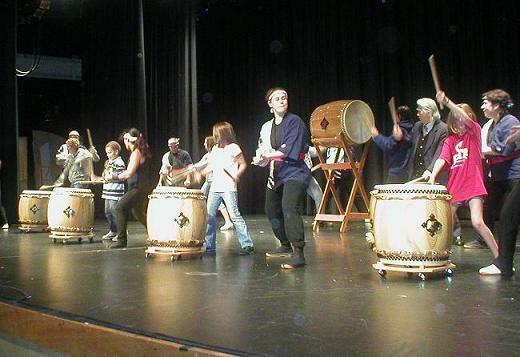 Many of Odaiko New England's drums came early to Littleton on Friday. Through the auspices of the Littleton Lyceum, Juni Kobayashi of Odaiko joined with Littleton school's music teacher Rachel Sowers to do a drumming workshop at the high school. Over 50 students attended and, according to Sowers, "the response was very enthusiastic." Sowers is considering adding a Japanese drumming component to the school system's musical curriculum. Many of the workshop attendees rounded out their drumming experience by coming to the program in the evening as well. Anyone who has played drums knows that it's a lot of work. "What good exercise that is!" commented audience member Judy White. Kate Jurow, an eight-year veteran of Odaiko New England agreed. "But after an hour of practicing up-drumming (drumming the large odaiko drums on stands over your head) you can be pretty sore." Jurow joined the group after hearing them play at the Cambridge River Fest. "I said to myself, 'I could do that!' But I didn't know then how hard it was." Jurow was one of ten people on stage who were as fascinating to watch as they were to listen to. Often the drummers would raise their left drumstick, high over their heads in unison while beating with their right; or they might describe large circles with their sticks before a climactic beat of the drum. Another move was to play the wooden sides of the drums or simply the sticks themselves, adding to the richness and variety of the sounds. As the evening progressed from song to song, the audience warmed to the players, at one point stopping the show midstream for a standing ovation. Later, members of audience were welcomed on stage to practice taiko drumming for themselves with some encouragement and instruction from the professionals. Japanese drumming was as elegant as a baroque fugue, as beautiful as classical ballet and had all the energy of a rock concert! The penultimate song featured six drummers across the stage standing, legs akimbo, behind their taikos as three other drummers sat in front of them and before their shimes and, behind them all, back to the audience, was Mark Rooney beating on the odaiko. Rhythms melded and changed as the tempo rose and fell. The playing would go from barely perceptible taps to near ear-splitting thunder. It was an enthralling evening! 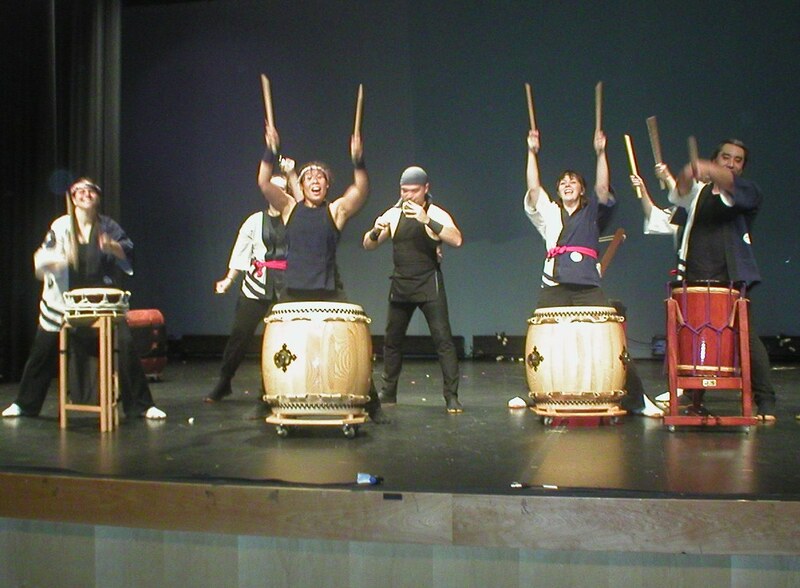 Odaiko New England gives lessons in and around the greater Boston area, as close as Concord. Anyone interested in more information can check out their Website at www.onetaiko.org. In addition, you may want to check out the remaining season of the Littleton Lyceum at www.littletonlyceum.org. Remaining programs include Leonard Solomon and his musically whimsical "Bellowphone Show" as well as a presentation by author Michael Tougias on Quabbin and a family-friendly hypnotist, Steve Wronkers. Tickets are available at the door of each performance.